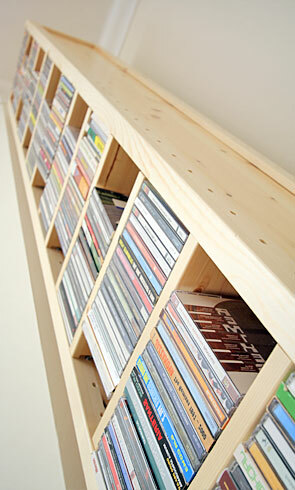 With our handy shelving design wizard you can create ideal CD storage shelves to suit virtually any space in your home. Despite the increase in MP3 players, every music lover still needs a convenient place to store their beloved original albums. Each shelving unit is available with either 14 or 18cm deep shelves and as our systems are modular, you can easily adjust and tailor your shelves to suit the amount of CDs you own. All our units are made from high quality solid pine and designed to last a lifetime. As you accumulate more CDs, you can expand your storage system, adding extra shelves, cupboards or drawers to keep essential items hidden away. The timeless design ensures our shelves suit all homes and workplaces, whatever your style. To add a personal touch you can also paint or stain your CD unit in any colour to match your decor. Proudly display favourite beats in the hallway, under the stairs, in the office or anywhere in your home. Simple and functional engineering means our shelves take just a few minutes in assemble and you can easily take down and re-assemble your unit when you move home or re-arrange your furniture. Storage boxes can make your home look untidy and take up large amounts of floor space. Maximise your space with a unique CD system. Nooks and corners under the stairs and rooms with sloping ceilings often contain wasted space. With our clever units you can really make the most of every inch of your home. Whether you have a studio apartment or a seven bedroom manor house, create your perfect multifunctional shelving system today. For more information about Shelfstore CD shelves, get in touch with our expert team. With over 30 years’ experience, we can offer the perfect shelving solution for your home or workplace.